I've never really been much of a fruit pie eater. Something about cherry pie filling in a can ruined my desire for fruit pies. So when my friend Haley said she was making us a blueberry pie last Saturday night, I was a little nervous. What if I didn't like it. All week I just kept thinking the worst. 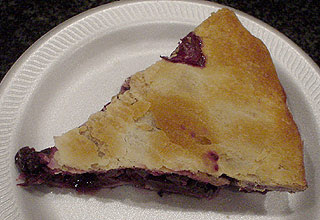 Then Saturday night came and Haley and Chris arrived with the blueberry pie still warm from the oven. Things seemed to change for me at that moment and I couldn't wait to try the pie. One bite and I was hooked. The pie was delicious. Will I try other fruit pies now? Only time will tell. Haley's Infamous Blueberry Pie Ingredients 2 cups (16 oz.) of blueberries – you can use fresh or frozen – washed & drained 8 oz. of real maple syrup sprinkling of cinnamon 4 tbs of butter 2 prepared pie crusts Directions Preheat oven to 450. Lay 1st pie crust in your pie pan. Place blueberries on top of crust. Sprinkle cinnamon lightly over blueberries. Dab butter over top of blueberries. Pour maple syrup over all ingredients. Top pie with 2nd pie crust – turn down edges and make slits in top for air to escape. Place pie in oven (Haley recommends putting a cookie tray on the rack below to catch drippings; as it can sometimes boil over). Bake on 450 for 20 minutes. Turn oven down to 400 and bake for another 20 minutes. Turn oven down to 350 and bake for the last 20 minutes. Pie bakes 60 minutes in total. Allow to cool for at least 3 hours.